Dubai-based Brit Sam Sunderland reckons his new factory HRC deal for the 2014 Dakar is like a ‘dream come true’. Sunderland is part of a five-strong factory HRC effort that will compete in next year’s famous Dakar event, which kicks off on January 5 in Argentina and finishes in Chile on January 18. Sunderland was part of the Team HRC presentation that took place in the MotoGP paddock ahead of this weekend’s Italian round at the spectacular Mugello track in Tuscany yesterday and in an exclusive interview with MCN, he spoke of his delight at being given the opportunity to ride the all-new factory CRF450 in next year’s gruelling Dakar. The 24-year-old, who is the youngest member of Team HRC, said: “It is a dream come true for me to be part of a project like this. I am still a young guy in the sport and I understand I don’t have a lot of experience and in rallying you need that to get a good result. 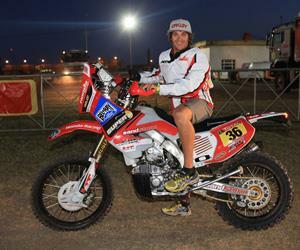 Sunderland suffered heartache in the build up to the 2013 Dakar when arm and wrist injuries suffered in a testing accident in America prevented him from competing in the event for the second time. The blow of missing the 2013 Dakar has only strengthened his determination to grasp another chance from HRC in an event recognised as one of the most severe tests of man and machine on the planet. Sunderland said: “I had an incident in testing just four weeks before the Dakar and it meant I missed it and that was devastating for me after a full year of preparation. "It was a big blow for me and it meant three months off the bike and I’d only got back on the bike just two weeks before the start of the Abu Dhabi Desert Challenge, which is the first round of the world championship in April. "I was getting my feeling back and my fitness back and it went really well. A small technical infringement cost me the win in that event after I got a 10-minute penalty. It was a tough way to learn after such a tough year but I took the positives out of the race and I managed to get another ride with HRC for the Dakar in 2014 and that is something I am really excited about. "There was a little bit of pressure on my shoulders for the Abu Dhabi Desert Challenge because my contract had run out at that point. They (HRC) signed me for that event and I managed to get a good result and only a small technical infringement cost me the race but I showed I have got the pace and the navigation and I work really hard every single day to make the most of this opportunity and I am really grateful for it. "They are putting a lot of work into developing the new bike. They had a few issues in last year’s Dakar but they collected a lot of data and this year I am 100% confident that the bike will be phenomenal. Last year for HRC it was a short period of time before the race to develop a whole new bike. Sunderland will get his first chance to ride the new CRF450 in forthcoming tests in North Africa before he takes part in the Morocco Rally and the Merzouga Rally and he added: “It will be like Christmas Day when I get to ride it and it will be a really cool feeling. "It is a new feeling for me because I am only 24 and most of the top guys have got 10 years more experience than me. I want to win and I work each day to try and win and improve myself but it is so difficult because you want everything now. "A lot is down to experience and certainly on the navigation side because it is not as simple as riding your bike through the desert flat out. So many things are going on that it is like trying to read the most difficult book in the world while playing a game of high-speed chess. Sunderland says he has been working tirelessly in recent months to improve on his navigation and he said: “Last year I really saw it was my navigation that needed improving and I have spent a lot of time working on that, making road books off Google Earth and stuff like that. Sunderland is poised to head to America for a training camp next week but his immediate travel plans were focused on trying to change his flight out of Italy to stay and watch this weekend’s MotoGP action. Sunderland is a big MotoGP fan but has never had the chance to visit a race and after meeting official HRC duo Dani Pedrosa and Marc Marquez he said: “I might have to change my flight because it is really spectacular arriving in the paddock.